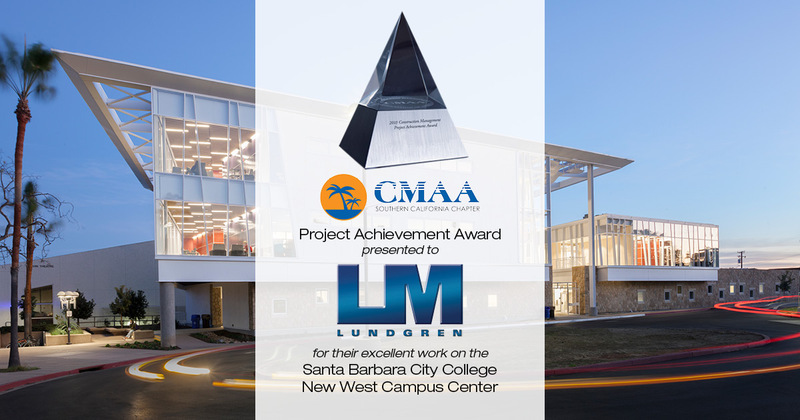 Santa Clarita, CA – The Southern California Chapter of the Construction Management Association of America (CMAA) is honoring Lundgren Management with a Project Achievement Award for its excellent work on the Santa Barbara City College New West Campus Center. The 2019 Project Achievement Award for the Center marks Lundgren Inc.’s fifth consecutive CMAA-awarded project. Lundgren is scheduled to receive the award during the CMAA Southern California Chapter’s 27th Annual Awards Gala on May 17, 2019 at the Hyatt Regency Long Beach. The New West Campus Center was completed in January 2018, on budget at $16 million, and was delivered by Lundgren utilizing the CM Multiple-Prime delivery method. The finished product was also honored by the U.S. Green Business Council with the LEED Platinum certification. The project architect was Kruger Bensen Ziemer Architects Inc. (KBZ). This is the second CMAA-awarded project designed by KBZ and managed by Lundgren Management. Construction of this facility provides a 33,610 square foot, multi-story facility, housing 23 traditional and studio style classrooms, 15 faculty offices, conference and break rooms, and more. The new center replaces nine aged portable classroom buildings. The project had its challenges. The start date was delayed 90 days and wildfires and subsequent landslides delayed the original completion date. Despite these regional challenges, the project was completed in time for the beginning of the 2018-19 school year. Fonder said the successful completion of the project was a team effort. Founded in 1987, Lundgren Management is a full-service construction management firm based in Valencia, with additional offices in the Inland Empire and Central Valley areas. Lundgren provides construction, program, and project management services. For more information, visit www.lundgren.net or call (661) 257-1805.